Welcome to the Savannah River Basin Partnership home page. The water resources of the Savannah Basin are a valuable natural resource essential to the citizens of South Carolina and Georgia. Water in the basin is used for drinking, recreation, commercial and industrial needs, and agriculture, and is vital for the existence of fish and wildlife. The Georgia Environmental Protection Division (GA EDP), South Carolina Department of Health and Environmental Control (SC DHEC), and South Carolina Department of Natural Resources (SC DNR) have formed a partnership to worked together on many issues to manage this important resource. Jasper County, SC to the left. 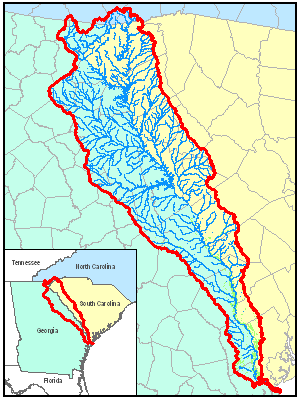 The Chattooga and Tallulah Rivers join in the Savannah River headwaters to form the Tugaloo River. Further downstream near Hartwell, Georgia, the Tugaloo River joins with the Seneca River from South Carolina to form the Savannah River. From here the Savannah River flows southeasterly to the Atlantic Ocean. Finally, at the terminus of the river is the Savannah River harbor. 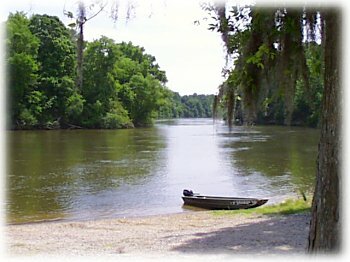 The Savannah River, which is approximately 300 miles long, is the most extensively used surface water resource in the basin. It is fed by many moderate-sized tributaries, some of which have drainage areas greater than 200 square miles and are significant surface water resources in their own right. The major impoundments in the basin are Hartwell Lake, Richard B. Russell Lake, and J. Strom Thurmond Lake (Clarks Hill Lake), all Corps of Engineers reservoirs. Hartwell Lake is a 56,000 acre reservoir located at the confluence of Tugaloo River and Seneca River. 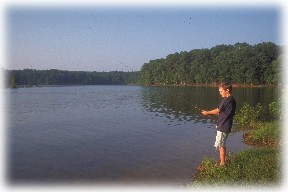 Richard B. Russell Lake is a 26,000 acre reservoir just downstream from Hartwell Lake. Clarks Hill Lake is a 70,000 acre reservoir on the Savannah River northwest of Augusta. Other significant lakes include Lake Keowee and Lake Jocassee which are found in the South Carolina headwaters and drain to Hartwell Lake. The Savannah River forms the state boundary between South Carolina and Georgia for almost 200 miles and the states share the water resources of this basin. Growth and development on both sides of the Savannah River are increasing demand on the resource. Recognizing an opportunity to begin a process to discuss water issues of mutual interest to the states, Governor Sanford and Governor Perdue established, by executive order in June 2005, the Savannah River Committee. Members of the Committee, appointed per the executive orders, have been meeting since September 2005. Links to topics, agencies, and committee information are found on the left side of the web page. Copyright © 2008 by the Georgia Department of Natural Resources. All rights reserved.